Neli Atiga - Every Nation Christian Church Brisbane Inc.
NELI was raised in a musical Samoan family – both his mother and father come from a long line of hymn composers, singers, pastors and musicians. He was brought up learning classical piano from the age of 5, singing from a young age, and has always been a music enthusiast. In his teens he developed a particular inclination for music from the Hip Hop, Gospel and Jazz genres of music, and began MCing and playing in bands. 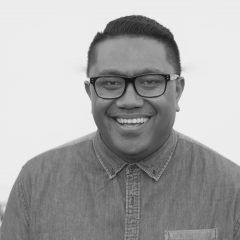 In 2000, Neli went into full time pastoral ministry with Every Nation as a campus minister and associate pastor, and in 2001 he became the music director for Every Nation Christian Church in Auckland NZ, and he has had the opportunity to travel extensively throughout the world as a music team trainer, equipping worship teams and church musicians in their craft and theology. In 2006 upon marrying Tina, he moved to Singapore and held the post of an Associate Pastor and Worship Pastor with Every Nation Church Singapore, traveling extensively throughout the region speaking and teaching, with a passion particularly to see the arts redeemed, and to see this generation won for the glory of Jesus Christ. In 2011, Neli and Tina planted the first ENCS satellite campus called EN Central (now Every Nation Kallang), which brought the Church to a bar on Orchard Rd – the most famous shopping street in Singapore. They pastored the dynamic church there for three years before God sent them back Down Under to Brisbane Australia where since mid-2014 they have been the senior pastors of Every Nation Brisbane in Australia. They have 3 beloved children, Nazareth, Zion and Jordan.